JP (Vol.1) 2013-11-27 ¥1,200 ? JP (Vol.2) 2013-11-27 ¥1,200 ? JP (Vol.3) 2013-11-27 ¥1,200 ? US (Vol.1) 2013-11-27 $9.99 ? US (Vol.2) 2013-11-27 $9.99 ? US (Vol.3) 2013-11-27 $9.99 ? UK (Vol.1) 2013-11-27 £7.99 ? UK (Vol.2) 2013-11-27 £7.99 ? UK (Vol.3) 2013-11-27 £7.99 ? 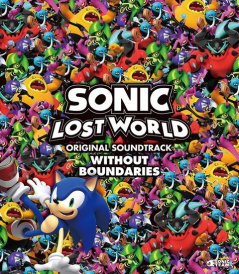 Sonic Lost World Original Soundtrack Without Boundaries is a triple album containing the music to the Wii U/Nintendo 3DS game of the same name. The entire packaging to the release is oriented vertically, including the booklet which contains detailed linear notes for each track. Original Music Taken From "SONIC COLORS"
Original Music Taken From "SONIC HEROES"
Original Music Taken From "SONIC ADVENTURE 2"
Original Game "SONIC LOST WORLD"
This page was last edited on 21 May 2018, at 12:45.